We all have our little fears, right? Some people are afraid of heights. Some people are afraid of clowns. 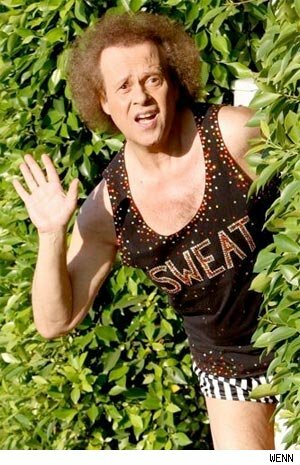 I think it's safe to say that we're all just a little afraid of Richard Simmons. These fears are perfectly normal. Then there are fears that are completely unjustified. For example, I'm terrified of dying in a submarine. Why? I have no idea. It's not like I come in contact with submarines on a daily basis. In fact, I'm pretty sure the only way I'm going to die in a submarine is if some freak accident happens on the Finding Nemo ride at Disneyland. And then I'll get my name added to that super cool Snopes page about Disneyland deaths! Stop rolling your eyes at me. It could happen. How does one prepare for that? 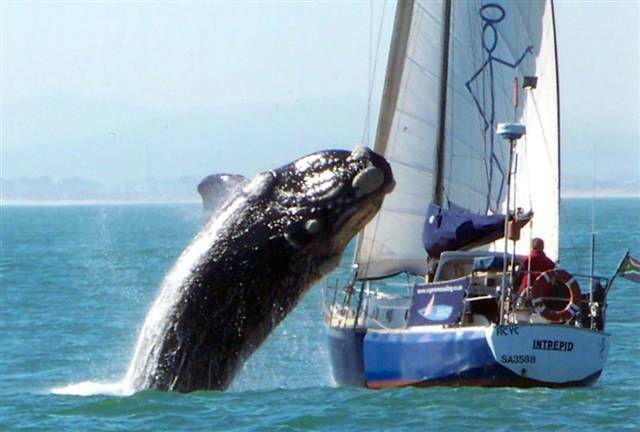 Is there some sort of Captain Ahab-inspired class on what to do if a whale jumps at you? 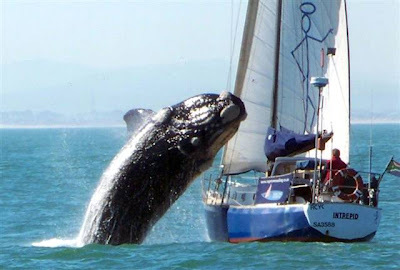 Is there an insurance policy in the event of whale damage? Why am I even worrying about these things?! I guess my dreams of marrying a wealthy yacht-owner have officially been killed. So, for awhile now, one of my goals has been to become a better goal-setter. But, seeing as how I'm not a good goal-setter, I didn't accomplish that goal. About a month ago, I decided to set a very important and challenging goal for myself: Try every flavor of Bluebell (that Walmart carries). Obviously, I have my priorities all figured out. Thanks to the help of my amazingly cool grandma, I'm getting close to accomplishing this crucial goal. (I'm also getting close to accomplishing my goal of becoming diabetic before the age of thirty, but that's a different matter.) You can all be very impressed. I think I'm going to have to start a new career as a Bluebell smuggler. Maybe I'll bring some back to Utah, and if y'all are really nice to me, you can have a bite of it. And then the Bluebell withdrawals will commence. So, I'm sure I've talked about this before, but I always say that some people need to hire a "No" Girl (or Guy)--someone who says "No" to really bad ideas. This is especially true for a lot of people in Hollywood. (I'm talking to you, George Lucas.) I would gladly be the "No" Girl. I would also like to be the "That's Enough" Girl for some other people. Specifically? Jerry Bruckheimer. I think he knows how to produce some very entertaining movies. But he doesn't know where to stop, and this is why we get to endure Pirates of the Caribbean 2 and 3. I should have been there to say, "That's enough, Jerry," when the first Pirates ended. *Sigh* Where was I? Well, I saw Sorcerer's Apprentice on Saturday, and it was fun. A good, entertaining popcorn movie. But, we all know that Jerry isn't going to leave it at that. Oh, no. He's going to trample it into the ground with a sequel, if not more. So, I want all of us to work together to stop this from happening. On the count of three, we're going to shout out the magic words. 1, 2, 3. "THAT'S ENOUGH, JERRY!" While we're on this subject, I would also like to be the "Yes" Girl for Christopher Nolan. Have you seen Inception yet? Stop what you're doing (reading this blog) and run to the nearest movie theater. And make sure you say, "Yes, Christopher. YES!" Is it just me, or does soccer seem to have a high number of good-looking players? I mean, more so than any other sport? I don't understand why people say soccer is boring to watch. So what if during a 120 minute long game, only 1 goal is scored? (Congrats, Spain.) LOOK AT THE EYE CANDY, PEOPLE! Can we stop with the 3-D trend? Please? I realize that it gives you an excuse to charge more for movie tickets. I realize that it gives you a way to take a mediocre script and make it a little more bearable to watch. I don't need to see Shrek coming out of the screen. I don't need to see Step Up in 3D. (I don't need to see it, period, but that's beside the point.) I don't need to see SORORITY GIRLS IN 3D!!! GAH! I'd say more, but I'll let my buddy Roger say it better. P.S. If this 3D trend continues, I will no longer put those 3D glasses back in the bin. SO HELP ME! Take THAT! There's nothing like going on a vacation and neglecting all responsibilities. And then you come back from the vacation, and you still neglect as many responsibilities as you can, just for good measure. I'm still in partial neglecting mode, just for your information. And, since one of the rules of partial neglecting mode is that you can't strain your brain too much, I'm not going to write a new post. I'm going to pick one from the draft folder! Well, I thought it would be a shame to let some of our creativity to just die in the basement. (Ashes to ashes, basement to basement. What?) So, here is the collection of our Refrigerator Haikus, crafted ever so brilliantly using Movie Quote Magnets. I am in the truth. I'm mad as a mission from God. I hear you talking to me. I once shot a boy's best friend. so I got no place.